Vacuum cleaners are time-saving products that can quickly and efficiently clean up the house. They pick up dirt and debris from different kinds of surfaces and trap it in a dust bag or bin. Depending on how the dust is collected, the model can be a bagless or bagged vacuum cleaner. An economical and highly versatile appliance, the bagless vacuum cleaner is quickly becoming the most popular option amongst most households. They require less maintenance and replacement compared to a bagged vacuum. This is because the dust and debris collected by the vacuum cleaner is deposited in an airtight dirt bin instead of a bag. Emptying out the bin is also extremely convenient. These models are not only economical but also environmentally friendly. Most brands are now competing to create a bagless vacuum cleaner that packs all the power and punch of a bagged version. For instance, HEPA filtration (commonly used in bagged cleaners) is now being introduced in bagless vacuum cleaners. So what is the best bagless vacuum cleaner on the market? Read on as we review the top models available in the UK today. The Miele Blizzard CX1 Cat and Dog Powerline is one of the models in Miele’s first series of bagless vacuums. Designed almost exclusively for households with pets, this cleaner does an excellent job of cleaning stubborn pet hair in a single swipe. This canister vacuum is also equipped with powerful hardwood and carpet cleaning floorheads, making it a great all-rounder. It outshines not only other bagless models but also many traditional bagged vacuums. With a capacity of 2.9L, the clear dust bin is large enough to accommodate a good amount of dust and debris. The self-cleaning filter pushes most of its trapped dust to this bin. It is also considerably easy to empty out. The HEPA filter itself may require cleaning once or twice a year. Despite its bulky build, the CX1 Cat and Dog canister vacuum glides easily due to the 4 wheels. It is also not necessary to carry the cleaner frequently as the 6.5 m cable covers a wide range of area. This attachment is the headline feature of this cleaner. It is a turbo brush designed to swiftly clean out any pet hair from fabrics, carpets and upholstery. The rotating brush is equipped with 2 rows of stiff nylon bristles. These are able to pick up minute pet hair stuck deep within the fibres. It can be operated on two speed controls, which can be switched between using a convenient slider. Aside from this, the EcoTeq floorhead is provided for general cleaning (hardwood and carpet floors). The Cat and Dog floorhead, however, is sometimes easier to manoeuvre on carpeted stairs. This is because the brush bar avoids suction making the attachment extremely convenient for such spaces. Awkward spaces and corners, on the other hand, may require the upholstery tool. With a 1200W motor, the power of the vacuum cleaner is undoubtedly the main benefit of this device. The high suction power comes with 4 levels of cleaning power. These are marked (from low to high) by the appropriate surface – curtain, rugs, carpets and hardwood floors. The single cyclone present in the device can generate a large amount of suction and airflow. The additional Cat and Dog floorhead ensures deep cleaning of surfaces such as carpets and rugs. Given the powerful suction, the cleaner typically required no more than two swipes across the surface to pick up even stubborn dirt and debris. The device is also designed to minimize contact with dust. The dustbin can be easily emptied and the self-clean function is also provided for the fine dust cleaner. The curved handle reduces the strain on the wrist by allowing the hose to exit and rotate underneath it. The cleaner also comes with many other handy features such as the long tube and numerous attachments. It is also a much quieter appliance despite a highly powerful suction. A bold crimson body with grey accents also makes it a visually appealing household device. Since it is quite large and bulky, storage may prove to be inconvenient. However, these drawbacks are only a small hindrance compared to the overall benefits of the product. Shark cordless vacuum cleaners provide tough competition in the market. The innovative features of most high-end bagless cleaners are offered at a relatively affordable price. The Shark Duoclean Cordless IF200UKT (or “TruePet” model) is the special pet-hair version of the Shark IF200UK. It comes with a motorised pet tool that is dedicated to picking up minute pet hair. The Shark Duoclean cordless is also equipped with other attachments like the crevice tool, upholstery tool and dusting brush. The twin batteries and HEPA quality filtration are enough to convince you about the performance of the cleaner. The attractive DuoClean and Flexology features are benefits of the best Shark cordless vacuums. Along with the versatility of attachments, the cleaner can also switch between handheld and stick. The device also comes with an impressive warranty of 5 years (1 year for the battery). There are some drawbacks, however, that you will experience when using this device. It may feel heavier than most other cordless vacuum cleaners. This is because it weighs almost 4 kgs (with the DuoClean floorhead). This can make it difficult to carry and transport between rooms or floors. However, most of the weight is concentrated on the attachment and therefore, it will not be a hindrance when cleaning. The two rotating brush bars of the cleaning head gives this product the “DuoClean” feature. It works equally well on hardwood and carpeted floors. In the hardwood mode, the felt protection ensures the brush does not make any marks on hardwood floors. The carpet mode, on the other hand, makes the brushes spin faster and uses more battery power. The DuoClean floorhead is also equipped with bright LED lights to illuminate the darker spaces (such as areas under furniture). The mini motorised cleaning head (for pet hair) is similar to the DuoClean floorhead. It also comes with a small rotating brush bar. The “Flexology” wand is an effective and revolutionary feature. It is the best way to clean inaccessible spaces under low objects. The floor under the sofa or cabinet, for instance, is vacuumed just as frequently and thoroughly as the rest of your house. The tube is equipped with a Flexology reach at its midpoint. This folds the tube down to lay flat on the floor. This also makes the device easy to store, as the tube can be folded when not in use. The pivoting cleaning head further adds to the efficiency of the flexology feature. The detachable battery sets this vacuum cleaner apart from the other cordless devices. Most cleaners require a fixed docking station, but the IF200UKT’s battery can be removed and charged anywhere with the provided charging docking unit. It takes over 3.5 hours to completely charge the battery for over 23 minutes of cleaning. Since there are two batteries provided, charging both to their maximum capacity gives you a high runtime of around 45 minutes. Being a trusted and reliable name in the vacuum cleaner market, this product promises the quality and innovation expected from a Dyson vacuum. 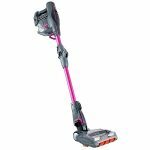 This bagless hoover is powerful, versatile and lightweight (2.61 kg). The Dyson V8 Absolute is the improved and upgraded version of the V6 stick vacuum. All the grievances of the previous versions (and most other cordless vacuums) have been improved. For instance, the runtime of most cordless devices is 20 minutes. The V8, on the other hand, delivers 40 minutes of powerful cleaning. Improvements in performance are accompanied by subtle changes in design. These features make the V8 a highly functional and convenient bagless vacuum. Although it is more pricey than most cordless vacuum models, it can be the one device you need for all the different surfaces you need to clean. The Soft Roller is a great tool for hardwood floors. The combination of soft fibres and carbon bristles is topped off by a soft roller. Additionally, it has an internal scraper bar that quickly removes dust from the fibres and directs it into the airflow. Carpeted floors can also be tackled quite easily with the Direct Drive head or the Mini Motorised Tool (for smaller areas). The choice of tools makes it an all-in-one vacuum cleaner. The chunky battery has been doubled in battery life from the previous V6 model. This means powerful cleaning suction for a longer time. It comes equipped with two modes of function – normal mode and maximum power mode. While the normal mode is sufficiently powerful, the maximum mode can be fired up for the odd spot of stubborn or inaccessible debris. The innovative design of the V8 is significantly different from most other bagless models. The bin, for instance, is assisted with a tiny clip that allows convenient and effective emptying. Earlier, emptying the dirt bin may have required a couple of taps or pokes to push stubborn debris out of the container. In this case, the new clip pulls the central cyclone away from the bin and simultaneously opens the base flap to immediately eject all the dust and debris from the bin. Another design feature is the exhaust vents on the side of the cleaner. The HEPA filter blows out exhaust air (with only 0.3-micron particles) to the left and right of the cleaner instead of through the back. This ensures the air is not directed at your face. As evident from above, the market appears to be filled with a large variety of bagless vacuums. The different features, prices and brands can be overwhelming for a first-time buyer. 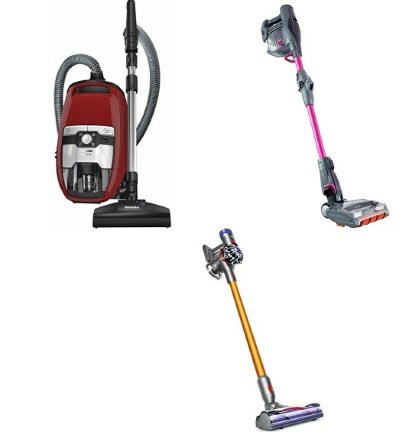 Therefore, determining the best vacuum cleaner depends on individual preferences. Every consumer must ask themselves some important questions to determine the right purchase for their household. It is also significantly different from choosing a bagged vacuum cleaner. Since these products are designed differently, there are different factors to consider before investing in a vacuum cleaner. Before these considerations, however, it is important to know why you are choosing bagless a vacuum instead of traditional bagged ones. Save Costs: Most bagged vacuums require frequent purchases of replacement bags. This raises maintenance costs. A bagless model, on the other hand, is equipped with a chamber into which the dirt collects. This can be emptied out and reused for the entire lifetime of the product. Eco-friendly: Since the bagless model does not require frequent replacement, there are lesser bags produced and thrown away. The dust and dirt is emptied out straight into the trash. Sometimes, it can also be suitable to empty it out into a compost pit. Find Lost Items: Another popular benefit of the bagless model is the ability to find anything you may have accidentally vacuumed up. The dust chamber can be opened up at any point (or while emptying) and it is relatively simpler to locate the object. Whereas, a bagged vacuum cleaner would require you to cut open the bag and sift around. Clear Dirt Bin: The chamber that is intended to collect the dust is clear and therefore, allows you to see its contents. This can be significantly beneficial. Firstly, it will be easier to know when to empty the dirt chamber as you can see it fill up. The second benefit is the ability to assess the efficiency of the vacuum cleaner. The visual proof of a bagless machine picking up dirt and dust can be very reassuring. It will also improve the efficiency of the product as you will not make the mistake of vacuuming with a full dust chamber. While there are numerous benefits of a bagless vacuum cleaner, it may not be the right fit in some cases. People with allergies, in particular, may find a bagless model a nuisance. This is because the dust is collected in a chamber instead of an airtight bag, which can be directly disposed of. While emptying the airtight dust chamber in a bagless machine, some dust or dirt invariably escapes into the air. This exposure to allergens can be a deal breaker for some consumers and households. Upright vacuum cleaners are also generally considered to have a more powerful airflow and suction. There is currently a large variety of bagless vacuum cleaners in the market that may be affordable or expensive. Your budget will considerably narrow down your choices as it can rule out the products that are out of your spending capacity. Some people define their budget with an upper-limit cap. For instance, you may be able to spend a maximum of £200. However, most people set their budget as a range. In this case, you may restrict yourself to products falling within a specific price range (such as £200-300). By setting a price constraint, you will be doing two things. One, the choices will be narrowed down by your budget. More importantly, you will ensure you do not waste time researching about a product only to find out it is not affordable. One of the most important aspects of choosing a bagless vacuum cleaner is to consider the type of surfaces you may have to clean. It may be a carpeted, tiled or hardwood floor. A hardwood floor is relatively easier to clean. It does not require too much power. A carpeted floor, on the other hand, will require a powerful vacuum cleaner to pick up the minute particles of dust. It is also important for the vacuum cleaner to be light enough to manoeuvre around the floor. Consider the space in your house. Smaller homes can usually manage with a vacuum that runs for a shorter period of time but are more versatile. Larger homes require significantly more powerful vacuum cleaners. It is also useful to make note of all the surfaces in the house. Stairs, for instance, can be a tricky surface to clean. Many vacuum models emphasize their ability to tackle surfaces such as this. Make sure you consider the manoeuvrability of the vacuum cleaner. Do invest in quality brands, but do not trust the brand to always produce quality products. Many brands are known for their bagless vacuum cleaner models. However, your own preferences must take precedence over expensive or branded models. Do your research and read the reviews of all your options. People with allergies may consider one type while those who want durability may decide on another type. Pet owners, in particular, must be careful about choosing the right vacuum cleaner to pick up the minute pet hairs from carpets. You may also consider the surfaces you intend to vacuum (upholstery, carpets, tiles and so on). Remember to check if your preferences match the product’s unique features. 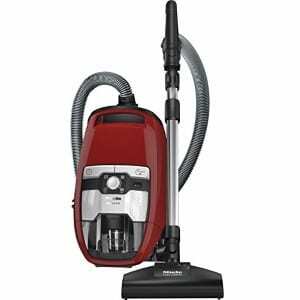 Bagless vacuum cleaners can be considered the perfect addition to a busy household. They are quickly accessible and can clean efficiently. However, deciding the best bagless vacuum cleaner can be a tricky task. A perfect combination of functionality and design can be considered the perfect product. As far as bagless cleaners go, this decision also depends on an individual’s unique preference and affordability. However, the Miele Blizzard CX1 Cat and Dog Powerline is possibly the best vacuum for a typical household. With the powerful performance, versatile attachments and classy design, the cleaner is worth its hefty price tag. It has all the advantages of a bagless vacuum cleaner and packs the power of a traditional bagged cleaner. This gives you the best of both worlds. It is particularly useful to solve the pesky problem of pet hairs. Those living with furry pets are well aware of the hair shedding issue. The Blizzard CX1 Cat and Dog has been designed for this specific purpose. It can pick up the most minute debris out of carpeted surfaces. Its functionality is undeniably attractive and makes this product the right investment. Choosing a bagless vacuum cleaner must, thus, be a fairly straightforward approach. Determine your preferences, choose the appropriate options and invest in a powerful and durable product. You will find that the Miele Blizzard CX1 Cat and Dog is the clear winner in most cases.